Morse accepted, writing commenced for what would become “Purpendicular,” on-stage work-outs were seized upon with relish, and the band breathed the heady air of rebirth. When “Purpendicular” was delivered, it astonished. 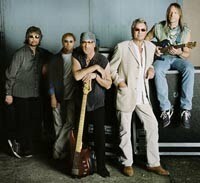 Rather than going softly into the long goodnight of “classic rock” middle-age, Deep Purple had reinvented itself. It took no more than a cursory listen to the likes of “Ted the Mechanic,” "Loosen My Strings” and “Sometimes I Feel Like Screaming” to drive this point straight into the skull. Morse brought a funkiness, a depth as guitarist and writer, an unparalleled fluidity as a soloist, a startling aptitude as foil to Lord, and an arsenal of influences – country, folk, jazz, what they’ve sadly labeled “fusion,” and an inherent understanding of blues-based riffs – that meshed effortlessly with the immaculate Glover-Paice sense of swing and Gillan’s seeming capacity to go anywhere at any time, full-throated and eyes ablaze. With Morse, Purple toured the world to accolades from the cognoscente. “Abandon” cemented the band’s on-stage prowess on record, and reminded us that Purple was, yes indeed, the heaviest of heavy rock bands. “Bananas,” the first record following Lord’s retirement from touring and his replacement by exquisite ivory-tinkler Don Airey, brought elements of pop to the table, grafted on some of “Purpendicular’s” ambition, and encapsulated the ensemble-riff power of “Abandon.” Tours behind both of these albums revealed this still-young band’s continued growth as a performing unit. By the end of the "Bananas" marathon, Airey had marked his apotheosis, from "replacement" to fully-integrated band-member. ”Rapture of the Deep” marks yet another new beginning, however. And it, more than any other record this side of “Perfect Strangers” and “Purpendicular,” offers a snapshot of the band transitioning into bold, uncharted territory. It’s as if all the pieces fit, not for the first time, of course, but in a manner that reveals a more pure portrait of just what this band is capable of. The whole transcends the sum of its parts, which is fitting for a record that seems to be, in a very real sense, about transcendence. ”As we all know, it’s hard to breathe/When something spiritual has taken place/We don’t know how, we don’t know why/We’ve been transported to a state of grace,” sings Gillan during the album’s title track, and this verse can be seen as indicative of the over-arching ethos behind “Rapture of the Deep.” Lyrically, it speaks of a spirit not content with the status quo in terms of interpersonal, social and political relationships, and this irreverent yearning is matched by the searching nature of the music itself, which also refuses to be ordinary. The album opens with “Money Talks,” a hook-heavy rocker with several twists in its tale, most notably Gillan’s harmony vocals during the chorus, his uber-hip sing-speak during the verses – recalling both “Fireball’s” “No One Came” and his own “No Laughing In Heaven” – and the manner in which the tune flirts with an Eastern modality before erupting into a searing Morse solo. “Wrong Man” slaps the listener in the face straight out of the gate with a strutting riff that can’t miss, as Glover and Paice exploit the pocket for all it’s worth, and Gillan kicks against the pricks in the voice of a character whose greatest crime seems to be having been in the wrong place at the wrong time. Both of these – like their siblings on “Rapture,” elegant and refined rockers steeped in blues and chomping at the bit, with names like “Back To Back,” “Girls Like That” and the hit single in waiting “Don’t Let Go” – are brilliant Purple tunes, estuaries from a river that never seems to run too dry. Ah, but the surprises… they’re many and varied here, and they elevate “Rapture” toward the rapturous upper echelons of the Purple canon. “Before Time Began” takes the form of a threatening march, an abscess dying to burst. Paice offers a dark subterranean shuffle, as the band lays down a series of melancholic chords, and Gillan, in a voice drenched in pathos, bemoans a world in which “Every day of my life I discover/Someone murdering my sisters and brothers/In the name of some god or another.” No mere political polemic, this, however; Gillan’s touch is too light, and he’s a master of “leaving things out,” so that his lyric is suggestive, rather than mere vitriol. “All of those bad ideas became the law/And we’ve forgotten what we’re looking for.” Indeed. And again, the Purple engine room is in full overdrive mode here, as an expansive call-and-response between Morse and Airey - who has made replacing Lord look easy, when we all know it is in fact far from it; Airey has made his mark on Purple, to be sure, by respecting what came before him and having the fortitude and chops to take it all somewhere new and exciting - leaves one feeling breathless and vulnerable. This is “progressive rock” in the most positive sense of that much-maligned term. The centerpiece of “Rapture” also happens to be one of the finest tunes in the band’s history – no small claim, that. “Clearly Quite Absurd” is clearly quite sublime; a piece with a melody that simply hurts to listen to, in the way that first love is painful because it’s ephemeral and fleeting. Thankfully, your disc player has a “repeat” button, so this is a love that will never abandon you. Gillan sings of escaping the snares of the mundane and commonplace, the accepted reality which deadens us to the potential one above and beyond it. Again, harmony vocals – Beatle-esque ones, in this instance – help set the mood, and an ascending chord progression led by Morse spreads its arms heavenward, eventually settling into a circular pattern that becomes one of the more moving codas not just in Purple history, but, yep, in the history of heavy rock itself. 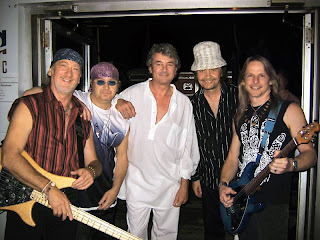 This is Deep Purple, 2005 version. Intense, fearless, full of fire, and wit, and passion. Marked by serious virtuosity, but never a slave to it. Still finding new meaning in a medium they all but single-handedly created. Grab ahold of this, and don’t let go. Автор: Valdemar ASCII на 09:28 0 коммент.